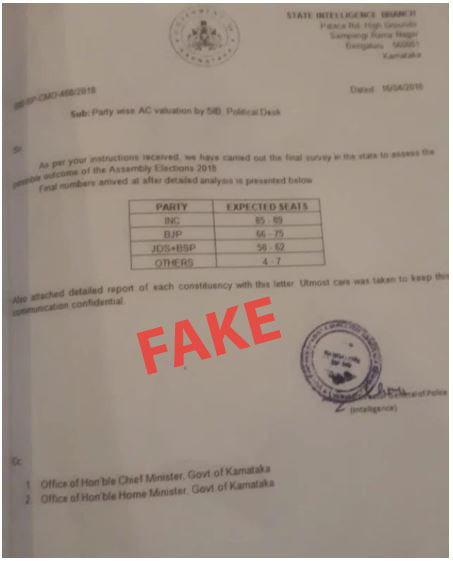 Another document has hit the fake news stand ahead of the Assembly elections in Karnataka. 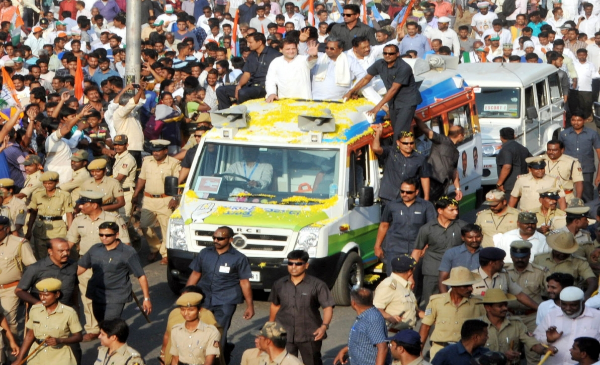 This document claims to be a correspondence between the State Intelligence Branch and the Chief Minister Siddaramaiah’s office and gives out a possible outcome of the upcoming May 12 elections. 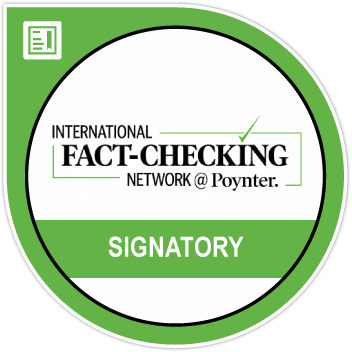 The story first appeared on The State, a Bangalore based news website which called out the document for being fake. The document dated April 16, says that the Intelligence department acting on the ‘instructions of the Chief Minister’s Office’ (CMO) carried out a ‘final survey in the State to assess the possible outcome of Assembly Elections 2018 and goes ahead to give a party wise result. According to this document, the Indian National Congress (INC) is expected to get 85-89 seats, the Bharatiya Janata Party (BJP) gets 66-75 seats followed by the Janata Dal (Secular) (JDS) at 58-62 seats and Others getting 4-7 seats. This document has been signed by the Additional Director General of Police (ADGP) (Intelligence) and is addressed to the Chief Minister and Home Minister of Karnataka. 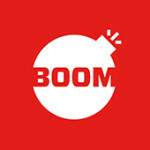 Interestingly, when BOOM contacted the Intelligence department it called out the document for being fake. B S Shanthakumar, DySp, State Intelligence Branch administration said, “The post of the ADGP intelligence is vacant and the document doing the rounds is fake.” He added that the department had submitted a complaint to the Halasuru Gate police station and an investigation was being conducted into the origins of the document. Calling it a “bogus document”, Shanthakumar said it was the work of mischief makers and they were conducting a thorough investigation to catch them. 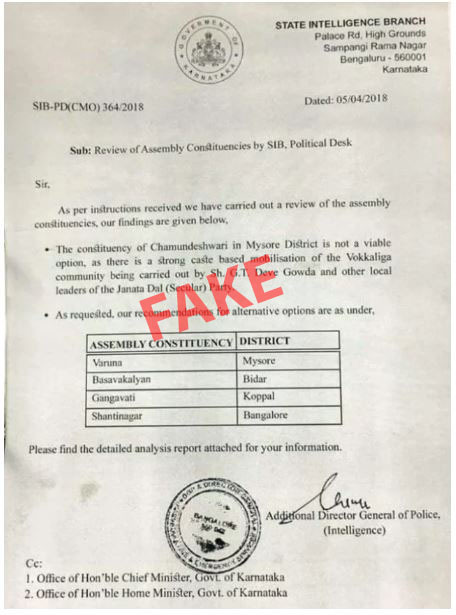 Earlier in the month, another document also claiming to be from the State Intelligence department went viral on social media wherein the Intelligence department had apparently advised Siddaramaiah to not contest from Chamundeshwari constituency calling it, “not a viable constituency as there is a strong caste based mobilisation of the Vokkaliga community being carried by GT Deve Gowda and other local leaders of the JDS party.” It further “recommends” four other constituencies — Varuna, Basavakalyan, Gangavati and Shantinagar — where he should consider contesting from. This list started doing the rounds before Siddaramaiah announced that he would be contesting from Chamundeshwari. Shanthakumar, confirmed to BOOM that “the previous list was fake too. It in fact had the seal of the Fire and Emergency Services department. How can it even be true?” The Halasuru Gate police station is investigating both the documents.